Peterson SBS and Veolia Environmental Services worked with Aker Solutions, the main contractor, on the decommissioning of the MCP-01 platform as part of the Frigg Cessation Project. Running through 2008, the project required shuttling daily deliveries of supplies and waste materials. 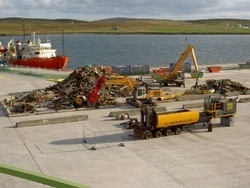 In total, around 6,600 tonnes of scrap and waste arrived at Lerwick Harbour’s Greenhead Base in containers and medium size pieces. Peterson SBS provided agency services, onshore logistics and transport requirements for all shuttling vessels. This included certification and tracking of offshore containers (CCUs) and the cyclic transport, tipping and inspection process involved with the waste skips. It also included packing CCUs, supply of all logistics, equipment and consumables, along with food for a 330-strong workforce offshore. All supplies and requirements were sourced, certified, packaged and tracked. Copyright © 2009 - 2018 Shetland Decommissioning. All rights reserved.